And here they are! If you click on the pictures you can study each one up close. If you are just dropping in for the first time you can hit the label "technique" at the bottom of the post and see what has been going on all in a row. This is before they were washed. This is after washing, not too much difference! Yeah! I washed them by hand in cold water with a bit of shampoo. 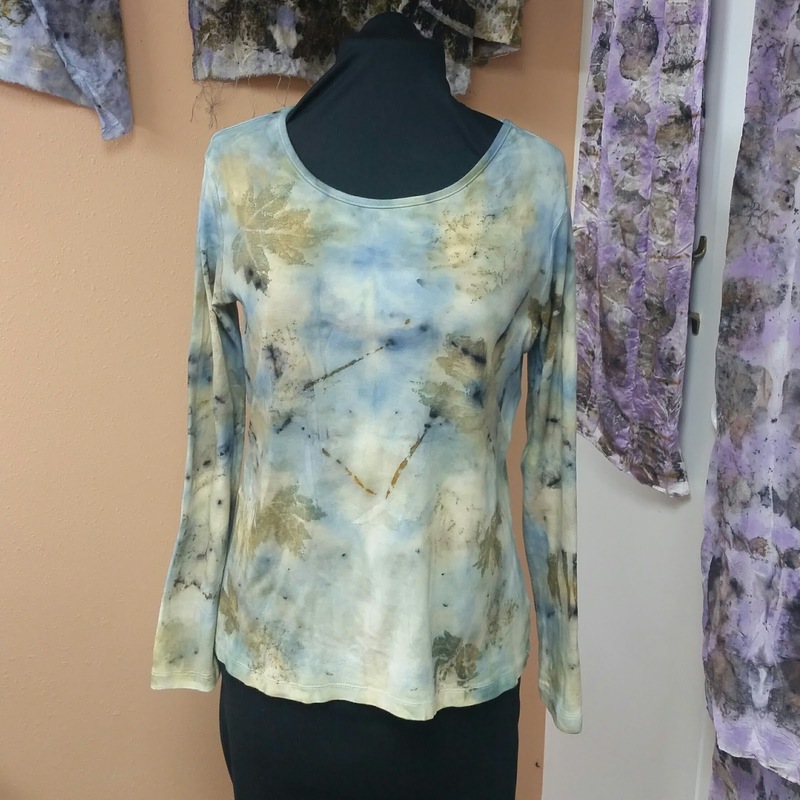 This shirt was pretreated with alum and a bit of soda ash, applied in separate applications and allowed to dry in between. 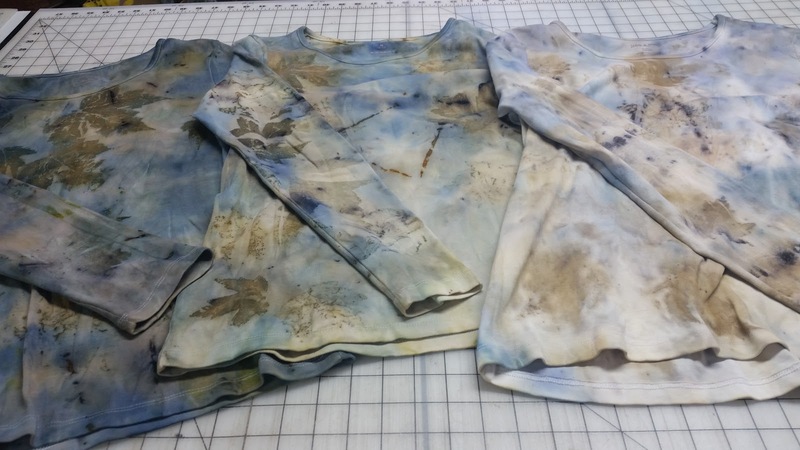 Normally one would let this sit around for a year or so before dyeing or printing, but I wanted to show the difference in the color tone from this method vs. using tannins. 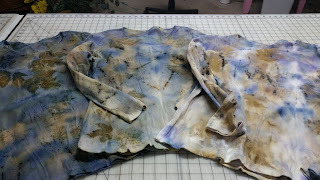 It will be interesting to see how long the color lasts since by most standards the mordant isn't "fixed". 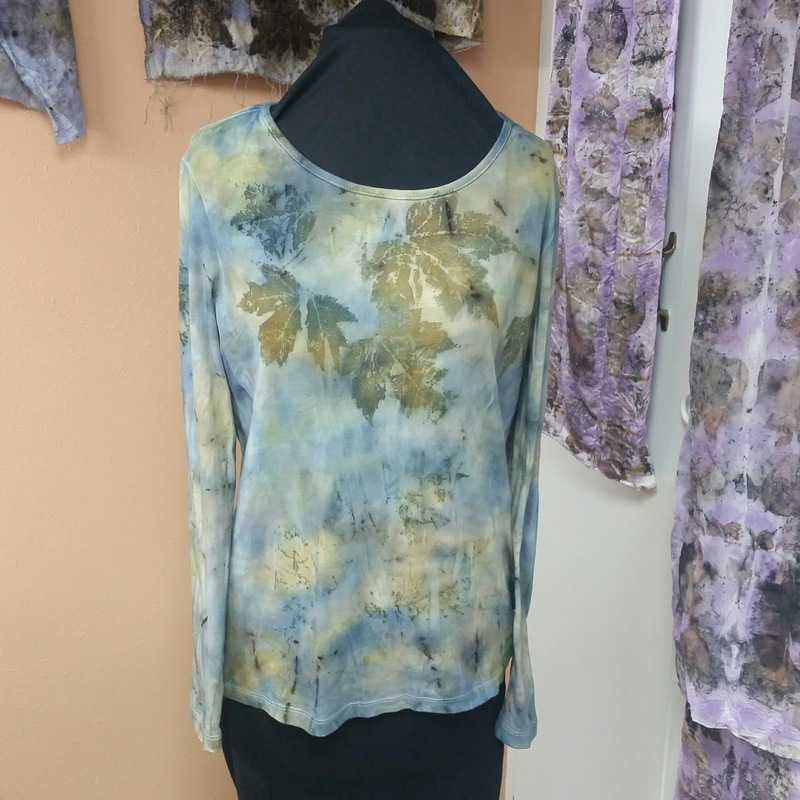 This is the shirt that I applied the alum first and then the tannin solution. As you can see the prints are more defined and the color is a bit deeper. 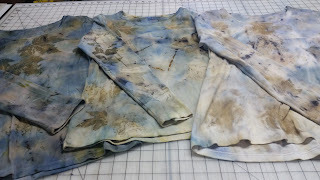 The last shirt is the one that I applied the tannin solution to first, let it dry and then applied a light alum solution. If you remember from the previous post, this one was also a really lovely shade of mauve. The color of the frozen iris is much darker and the leaf prints are very clear. 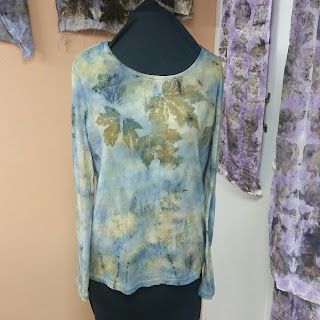 As a side note I really like the way the placement of the leaves came out, sometimes placing leaves on a finished garment is challenging, this worked really well. Now to wear and wash them for the year and see what they do. Since I was using the same plant material from shirt to shirt in order to make side by side comparisons, I bought three different sizes in order to keep track of what I was doing with the mordants. I like the way all three fit-it may just be that I need different pants to make each one look right. Why is that everything I do these days seems to require a shopping trip? These are so amazing!!!! 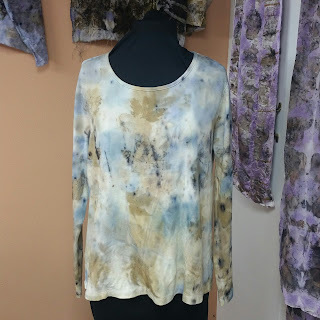 Are they silk? Cotton? I'm sure you said in the post but I want to talk about art. Can't wait to get home so we can visit! 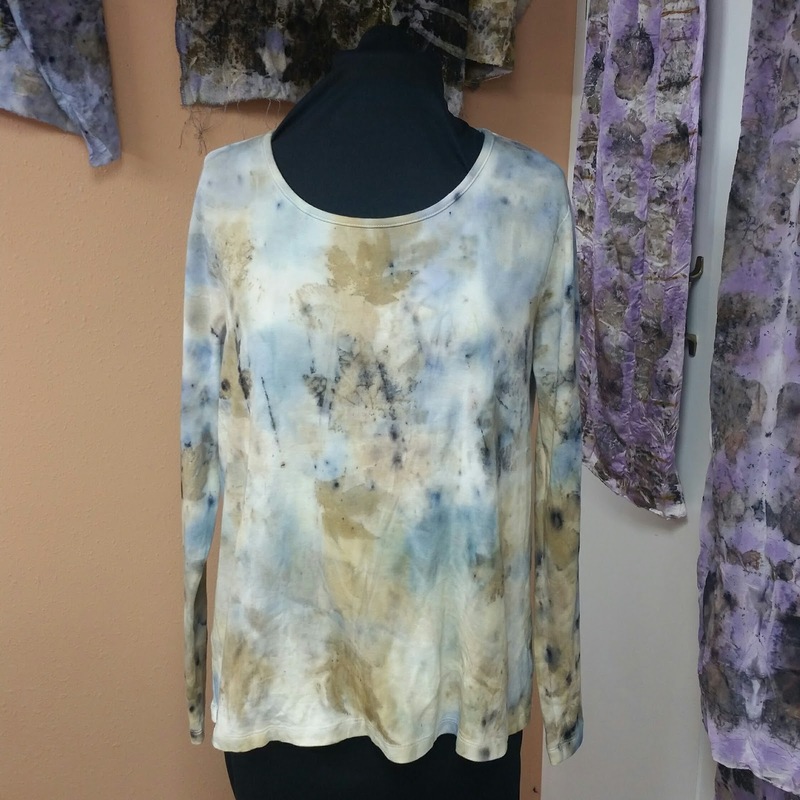 Cotton, that is why there is some question as to how long the color lasts. Hit the label technique and read through the posts. And yes,I can't wait until you get here!